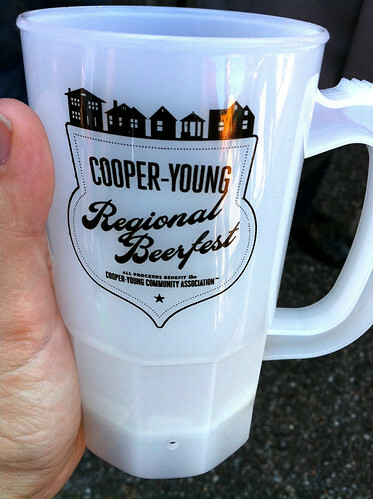 What is the Cooper-Young Beerfest? The Cooper-Young Beerfest is a fundraising event for the Cooper-Young Community Association (CYCA), meaning the money it brings in goes straight to the community. And what better way to support one of the most eclectic neighborhoods in Memphis than by drinking some beer? As in previous years, the 2018 Cooper-Young Beerfest will be held at Midtown Autowerks, located at 795 S. Cooper St. near the intersection of Cooper St. and Central Ave. When is the Beerfest being held? If you know anything about beer, you know that Oktoberfest is a big deal. With that in mind, it only makes sense that this year’s Cooper-Young Beerfest is set to be held on Oct. 20. During the month of September, tickets to the Cooper-Young Beerfest are available for $45. If you’re holding off on buying, don’t wait too long, as the price will go up to $50 after Oct. 1! What can you do at the Beerfest? As its name suggests, the Cooper-Young Beerfest’s main attraction is… you guessed it, beer. Be sure to sample the numerous craft beers on offer, and if you want a break from beer, check out the single cider location. Heading into its ninth year, the Cooper-Young Beerfest is a top fall attraction in Memphis that’s not to be missed! For more information, check out the Cooper-Young Beerfest website.